powered by the 5167cc V12, which delivers an impressive 0-60 mph acceleration time of 4.7 seconds with a top speed of 183 MPH (295 km/h). 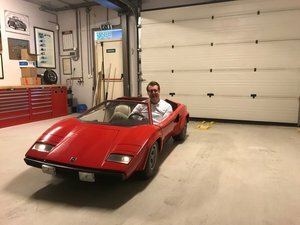 It was the most refined and possibly the fastest edition of the Lamborghini Countach: 0&#65533;97 km/h (0&#65533;60 mph) in 4.7 seconds and 295 km/h (183 mph) all out. The truly remarkable fact is that it is still just as powerful as a wide range of today's modern SuperCars. 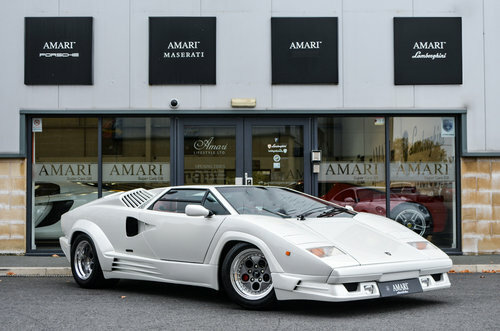 Our Lamborghini Countach '25th Anniversary Edition' is a 1995 Registered example in gleaming Ballon White + Rosso Leather Interior & has only covered 7,000 Miles from new with 4 UK Owners. This automobile represents an outstanding investment opportunity and the extensive provenance, presented in a bespoke leather folder, fully supports the remarkable opportunity offered here. 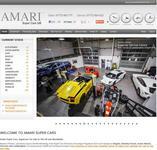 We have the original Owner's Pack with Manuals and the service book & 2 keys. 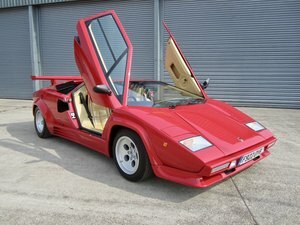 The Lamborghini Countach is a mid-engined, V12 sports car produced by Italian car manufacturer Lamborghini from 1974 to 1990. Its design pioneered and popularized the wedge-shaped, sharply angled look popular in many high-performance sports cars. It also popularized the "cabin-forward" design concept, which pushes the passenger compartment forward to accommodate a larger engine. 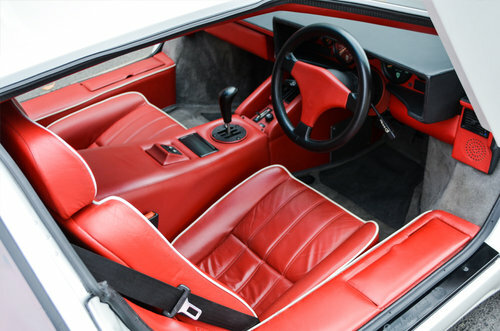 In 2004, American car magazine Sports Car International named the car number three on the list of Top Sports Cars of the 1970s, and listed it number ten on their list of Top Sports Cars of the 1980s. 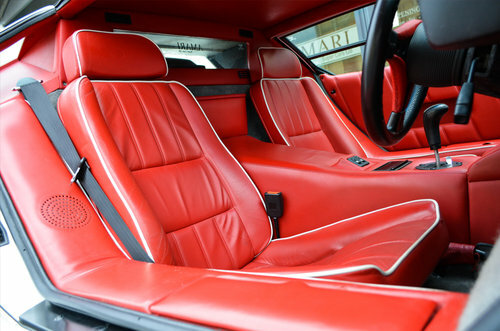 Named to honour the company's twenty-fifth anniversary, in 1988, the 25th Anniversary Countach, although mechanically very similar to the 5000QV, sported considerable restyling. Notably, restyling, enlargement and extension of the rear 'air-box' intake-ducts was among other refinements undertaken (extending them to a more gradual incline further in-keeping with aerodynamic-streamlining), while the secondary pair of debossed ducts, originally situated further behind them, were brought forward and relocated directly on top, encompassing refashioned fins now running longitudinally rather than transversely. Additionally, further reconstruction of an already modified engine-bay cover, from a concept consisting of dual-raised sections and tri-ducting, to one that embodies a centre-raised section incorporating dual-ducting become another feature. Various redevelopments to the rear-end were made; most notably the introduction of a rear bumper extending outwardly from the lower-portion. 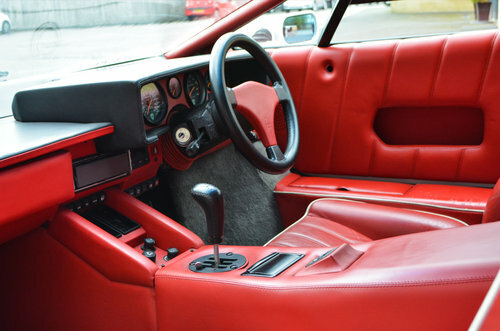 These styling changes were unpopular with many&#65533;particularly features such as the fin strakes within the primary rear-intake-ducts openings, which appeared to mimic the Ferrari Testarossa, though providing crucial improved engine cooling. Nonetheless it was only outsold by the QV model. It also featured 345/35R15 tyres; the widest tyres available on a production car at the time. 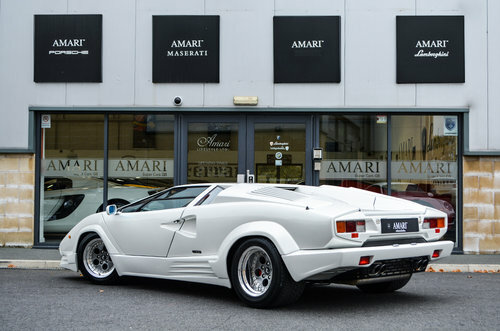 The Anniversary edition was produced up until 1990 before being superseded by the Lamborghini Diablo.